But even if it took some (me) longer than others, we’re getting back to normal now! 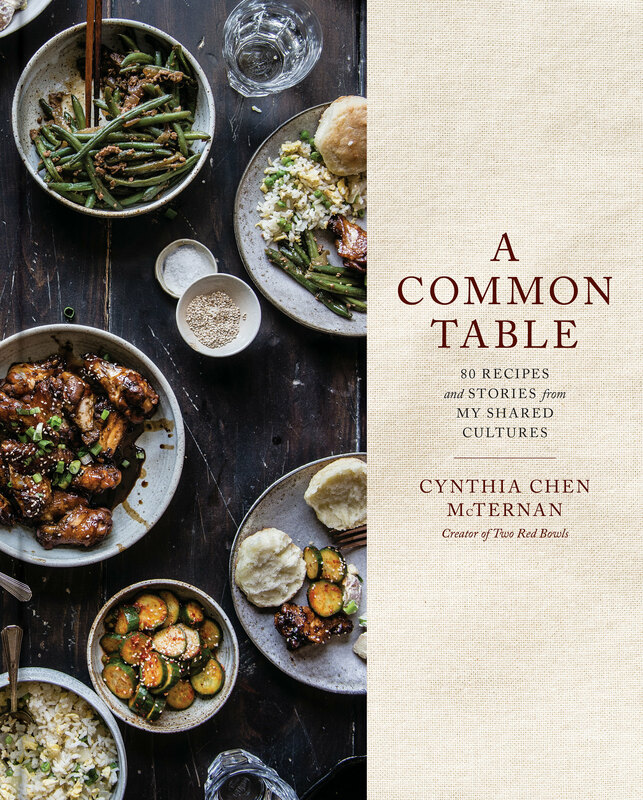 And thank goodness, because we are partway into 2018 and I still have so many wonderful cookbooks from 2017 to dig into. This gem of a salad is from Neighborhood, by Hetty McKinnon (of Arthur Street Kitchen goodness). Hetty has that special skill of crafting salads that manage to be fresh, filling, and flavorful all at once. The salads in Neighborhood have never seen the inside of a shrinkwrapped bag of chilly iceberg mix (unlike, ahem, my kitchen), but are full of texture and flavor, the sort that aren’t relegated to the side of a plate but are a meal all their own, and make January healthful eating feel like a desire, not a burden. 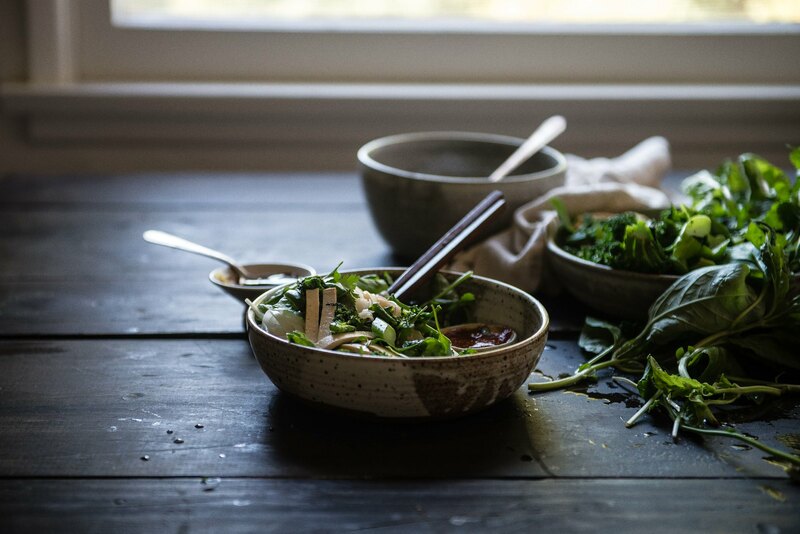 This pho salad is a case in point–in a total genius twist, Hetty manages to distill a bowl of traditional pho into a quixotic, punchy (and vegetarian!) dressing (which calls for the great fun of holding your onions and ginger over your gas stovetop and hoping you don’t burn the house down) that infuses rice noodles, peppery herbs, tofu, and slightly charred broccolini with the savory, sweet, and hearty flavors of their namesake, without the broth and, even more impressively, without the meat. The slippery rice noodles contrast beautifully with the five-spice tofu (incidentally, maybe my favorite snack ever), and, to my carb-loving surprise, I found the broccolini to be the star of the show–surprisingly savory, with a satisfying crunch that truly makes the salad feel substantial. The best part, though, is this: If you, like me, happen to make this just before getting knocked out with a nasty cold, there’s nothing stopping you from abandoning your salad aspirations and transforming this back into pho–just add a little extra stock to the pho dressing to turn it into hot broth, and toss your salad fixings right in. It’s the best of both worlds. Reprinted with permission from Neighborhood, by Hetty McKinnon (Roost Books, 2017). 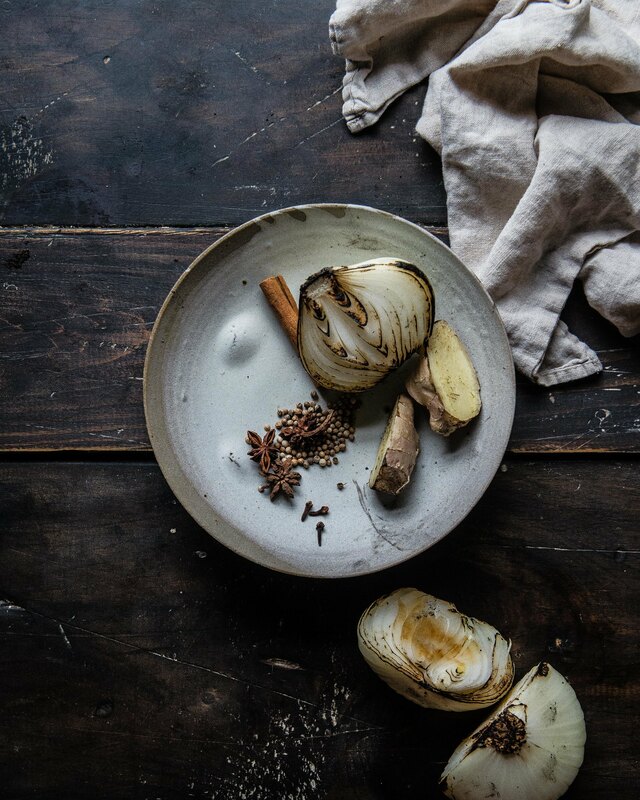 Don't skip charring the onions and ginger, which lends a signature smoky umami to the broth. To make the dressing, place the onions and ginger pieces directly on the flame of a gas stovetop or under a very hot grill (or broiler) until they are slightly blackened all over. Heat a large saucepan over a medium-low heat. Add the cinnamon, peppercorns, star anise, cloves, and coriander seeds and toast, stirring to prevent burning, for 30 seconds until aromatic. Add the stock, fish sauce, tamari or soy sauce, sugar, carrots, mushrooms, charred onion, and ginger to the pan and bring to a boil, then reduce the heat to low and simmer, uncovered, for 60–80 minutes until reduced by a third. Strain. Season with salt to taste and whisk in the olive oil. 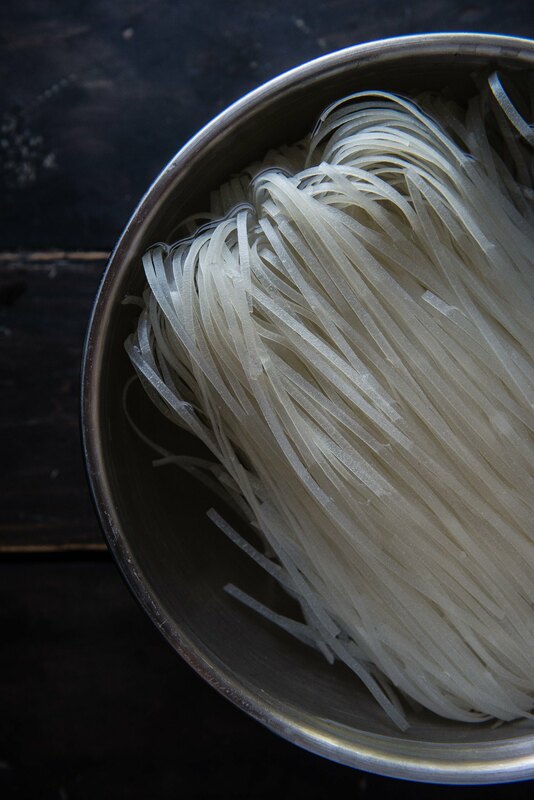 Bring a large saucepan of salted water to a boil, add the rice noodles and cook for 6–8 minutes until tender. Drain and refresh under cold running water. 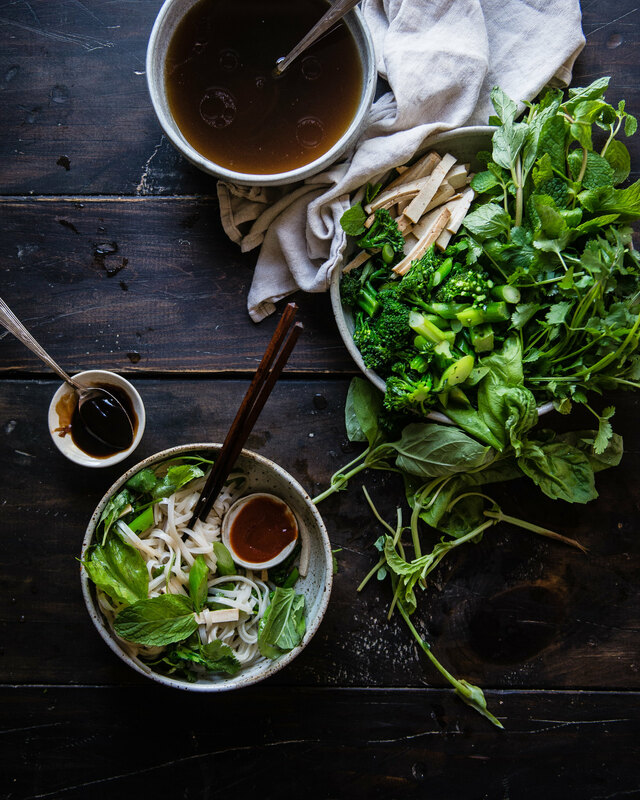 Combine the noodles, cabbage, broccolini, tofu, bean sprouts, and herbs and pour over some of the dressing. Mix together well, making sure everything is coated in the dressing and season with salt and white pepper. Serve topped with chopped chili (if you like) and lime wedges. Five-spice tofu is a delicious, dried tofu that is savory and chewier than what you typically find. 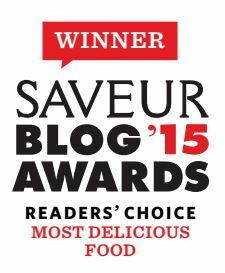 Find it in a Chinese supermarket, or look for "baked tofu" in some specialty grocery stores. I found baked tofu at Sprouts. If you aren't vegetarian, a little shredded chicken would go perfectly in this, too. Super, vibrant photos – the green looks cooling and satisfying on a 41 degree C, Australia supper day! 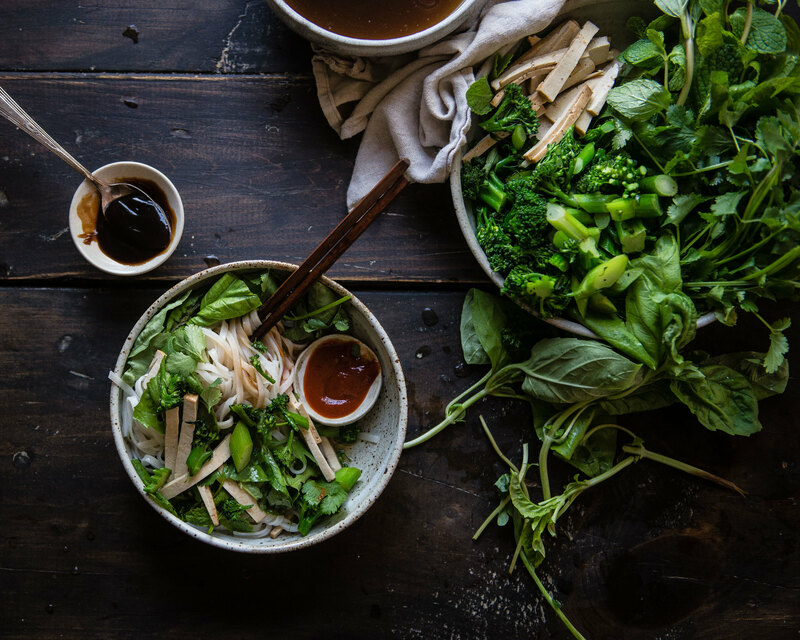 I love pho and I love salad, so this combo sounds like a match made in heaven. It looks delish! Also like you said, you can easily turn it into a soup. Magic. haha. a beautiful series of photographs and lovely recipe, hope that all are feeling better! 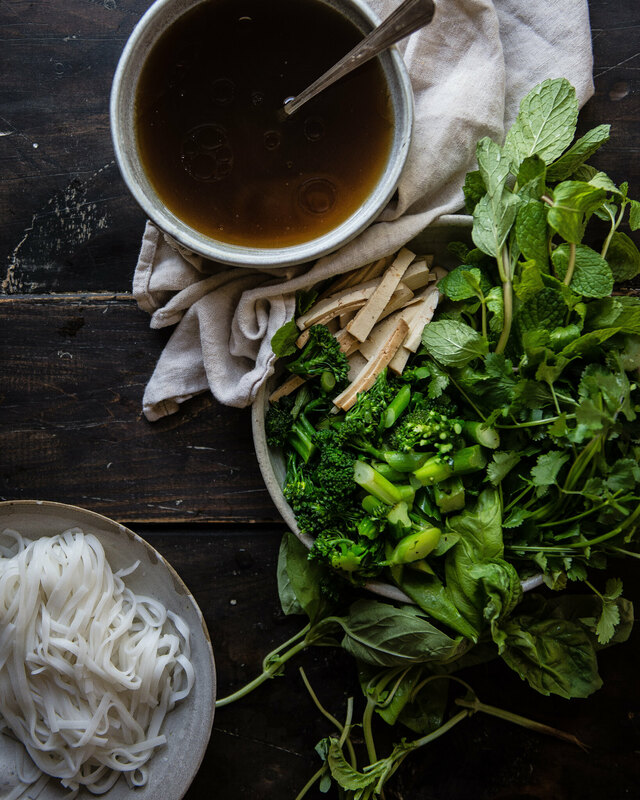 This pho would certainly help! I’m glad you’re all feeling better! 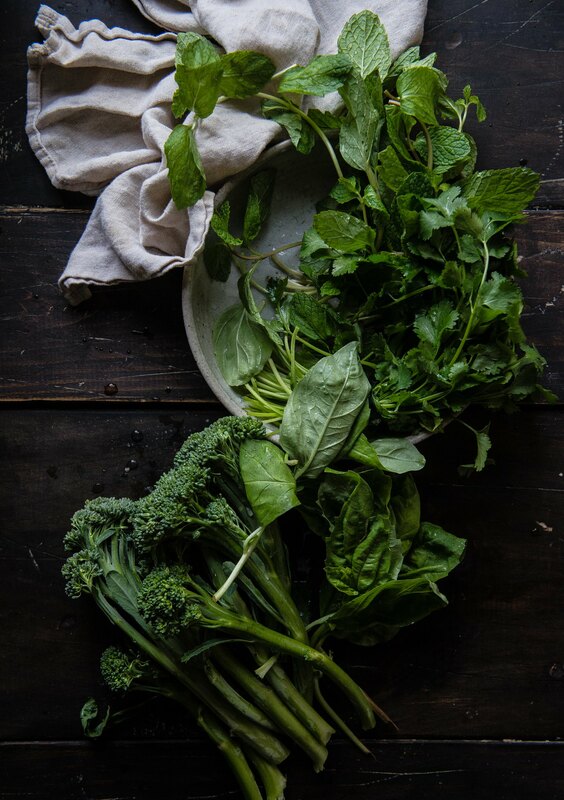 Also, I vehemently avoid most greens, but that broccolini looks delicious!